Ms. Rhonda J Peterson is an adjunct instructor at Morgan State University and the Community College of Baltimore County in Maryland for Academic Literary and Computer Literary students where she utilizes a multi-media approach as one methodology for classroom teaching. Moreover, she is enrolled in Morgan State University’s Urban Educational Leadership doctorate program. She is a graduate of Maryland University Baltimore County receiving her BA in English, Towson State University where she received a MS in Professional Writing and Morgan State University’s English Ph.D. program where she received 45+ credits. Her love of teaching and her fascination for photography grew from a love of the visual and written perspective in all of its multiplicities of meanings, for each perspective when combined signifies the totality of life. She feels that these chains of punctums reflect the human spirit, so her passion for photography and semiotics is reflected in each photo. 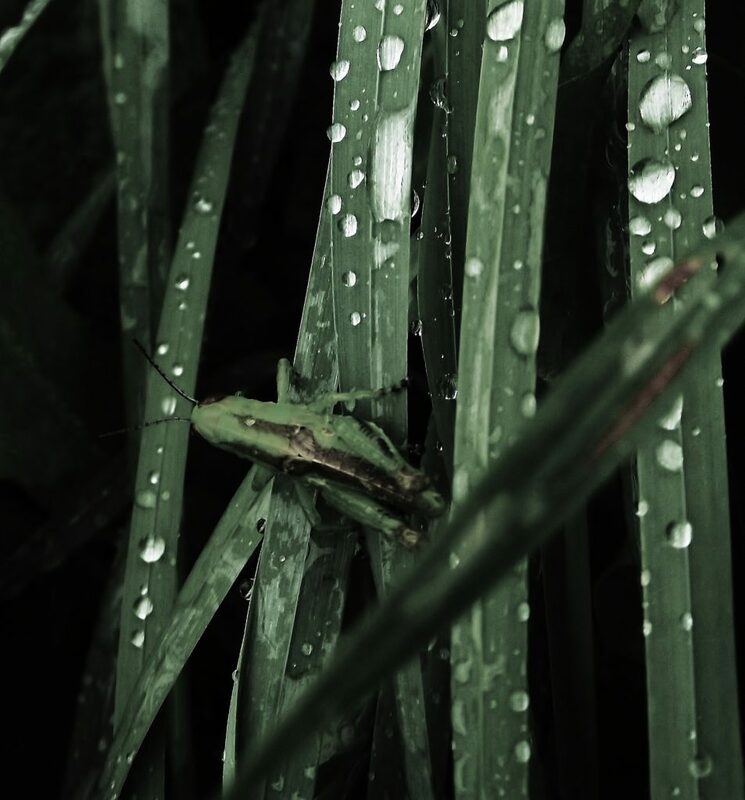 Anna Sudderth: This particular piece deals with nature, and the juxtaposition of a living grasshopper against inanimate, but eye-catching, beads of water. Does your photography often focus on nature, and specifically on the sorts of tensions at play in this photo? Rhonda Peterson: The dynamic tension lies in the space between life, existence, and the viewer which lends a suggestion of a binary opposition between life and live-giving. The energy that the grass hopper gives off from a moment of rest on the blades grass is seen by the viewer through the lens of the camera because such tension is hidden in the blades of grass; even the colors which are meant to camouflage because the grasshopper is just a shade darker than the grass highlights that juxtaposition. Anna Sudderth: On the theme of nature in your art, are there any specific landscapes or geographic areas that you feel particularly connected to artistically? You mention, for instance, that this photo was taken in your neighbor’s field in Maryland– has this setting been the source of a lot of your work? Rhonda Peterson: I’ve taken photographs in many locations, and yet, they all stand out to me through the lens. The composition that I seek the most is the energy, the “punctum moment” in nature when nature rises above the ordinary, when I can capture a balanced tension which is active and an extraordinary moment in time, lighting, and mood. On the day that I captured the grasshopper, there was a tremendous thunderstorm and the neighbor’s corn fields captured my eye. So I left the house with camera in hand to observe nature as everything seemed fresh and reborn. I have often taken photographs wherever I’ve lived or worked, from Maryland to the reservation, to the South Seas, Japan, Thailand, anywhere, so no specific location only the moment. Anna Sudderth: What about the medium of photography in particular speaks to you? Rhonda Peterson: Capturing a moment in time, not an era or specific historicity, but an action, a tension, and a balance, which can not be repeated because it is situated within the space of the temporal. Anna Sudderth: How have you seen your artwork evolving through time? Rhonda Peterson: My mother bought me my first camera, a Polaroid, which in my excitement, I ran to the local salon and captured my friends’ parents under the salon hair dryers, and for some reason, those parents snatched back those first photographs. From that experience, I learned to ask permission first. Later, I worked on lighting by capturing architecture at various times of day in natural lighting. I suppose, my photographic skills developed from observing and capturing specific features to recording the whole composition, from capturing the mundane to the extraordinary through intuition, observation and theory. And that isn’t much of an answer, but it’s the most honest. Anna Sudderth: What creative challenges have you encountered, and how have you worked through them? Rhonda Peterson: Finding the right moment in nature; in fact, I remember on Tinian, an island in the South Pacific, I was trying to capture the essence of a shipwreck (background) juxtaposed against living nature (nightshade in the foreground) with an inexpensive digital camera, so I stood for five minutes in one position, crouching and waiting for the camera’s lens to get enough light to enter the lens so I could capture this specific moment, a cloudy morning at 4 am and the beauty of nightshade (deadly plant) which was alive and a half-sunken shipwreck in the ocean’s distance (symbolized death) under the full moon; it turned out beautifully surreal. Nature itself is a challenge. Anna Sudderth: If you could pick one artist, visual or otherwise, whose work has been especially inspirational to you, who would it be? Rhonda Peterson: Impressionists first come to mind: Renoir, Monet, and the cubist, Salavtore Dali, but I also admire the symbolic simplicity of Georgia O’Keefe, the detail and lines in Marilyn Peterson’s art, the Korean artist Minjae Lee who expresses the inner self, and the complexity of Henry Peach Robinson’s photography. Rhonda Peterson: If you have a passion, you should follow it!